This pull request for #842 shows which plugin echoed invalid markup. If the user has the 'edit_post' capability, and the query var of amp_validate is present, it adds a response header. This has all of the data the the response on post.php has, in addition to a 'plugins_with_invalid_output' value. This array has all of the plugins that output invalid markup. But maybe this isn't the best way to display an error. The main item remaining for me is the failed Travis build. The tests seem to stop, without error, on PHP < 5.5. This might be related to the closure. Issue #842: Begin to validate plugins. There isn't yet a way to report inline scripts. This uses the 'src' attribute to find the plugin or theme. Issue #842: Align equals signs to prevent failed Travis build. Issue #842: Begin plugin callback validation. Iterate through all of the registered callbacks. wrap the markup in comments. any illegal markup is from. Thanks to @westonruter for this strategy. Issue #842: Handle 'Closure' callbacks in get_plugin(). Also, address a Travis error. Issue #842: Correct an issue in failed Travis build. The plugin is in 'amp-wp' in some Travis tests. Issue #842: Process comments for invalid plugin output. Add an extra parameter to track_removed(). If $source is passed, store that. look for the presence of $source. Issue #842: Align equals signs to correct Travis issue. Issue #842: Output validation errors in header. like on the post.php page. But also add a 'plugins_with_invalid_output' value. which had removed elements or attributes. Issue #842: Remove list() in favor of array access. as the order of assignment is different in PHP 7.0. So insted, access the array values. Issue #842: Align arrows vertically, remove extra constant. Issue #842: Use the constant CALLBACK_KEY. Issue #842: Modify how callback function is called. Mainly use the logic in WP_Hook::apply_filters(). This accounts for the number of accepted args. Figuring out where to display validation errors is tough. Normally this is something that we'd want to show in the admin bar, but this isn't available to us… yet. I think it should be a goal for us to get the admin bar to be fully supported, and then we can show the errors in it. But otherwise, what we may want to do is introduce a new admin screen for “AMP status”. This could eventually interface with the Google Search Console, maybe, to get an external view of AMP validity. This can be augmented with an internal view of validity, being populated with the results of what you are building here. Maybe what we should do is introduce a new amp_validation_error post type to store logs of such errors. Such a post could include the error, the URL where the error occurred, and plugin/theme responsible, and so on. 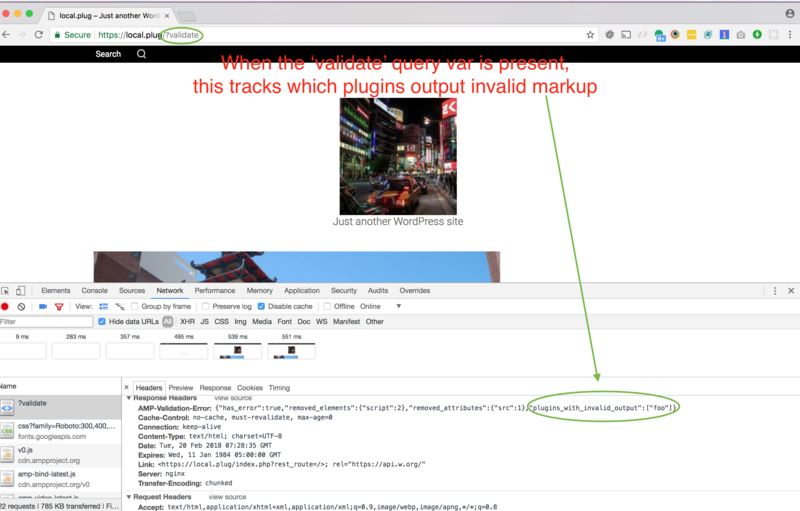 Then upon plugin activation, a request could be made back to the homepage with the query var auth key to request a validation check, and instead of the errors being returned as an HTTP response header they could be added as post type entries. (Warnings could be displayed at this point as well.) This process could then also be done at WP Cron to regularly check the homepage and maybe the most recently-published post. By having the errors logged then a user could be informed of them asynchronously, and with the original URL being present, the validation errors could be re-checked after the fact. There could be a button like “Re-check”. Duplicates should be avoided. So I suggest storing the validation error and the responsible plugin/theme in the post content and then taking the data and creating an md5 hash which then can be used as the post_name. If such a post already exists with that post_name, then no new post would be inserted, but rather perhaps a postmeta for that post could be modified to amend the URL for where the validation error is encountered. Eventually we'll want to include a WP-CLI command to crawl the entire site and find all validation errors with these being all logged. Issue #842: Remove 'static' from methods, add assertions. there's no need to declare the methods statically. Issue #842: Register validation error post type. Adding a response header isn't part of the plan. Issue #842: Store the validation errors in CPT. store the response in a custom post type. Address Travis error by aligning => vertically. * Remove needless lookup of post when it is passed as $post in print_status_meta_box. * Generalize remove_invalid_callback to be validation_error_callback; intend to pass validation error array, not just node. Merge track_removed into add_validation_error. * Check for stylesheet length overage while iterating over stylesheets; report validation error once reached instead of outputting HTML comments. * Report CSS mutations when removing !important and overflow from stylesheets. * Report validation errors regarding amp-keyframes. Continue to do existing content check on load of post type is not public. Only if post type supports content. But if public then opt for loopback request. Do with drafts too by passing cookies. Merge content check and frontend check? Otherwise do nothing. Beware of post status is not publish. The notice when saving post should indicate which plugins are are at fault. Add a debug link for the admin notice that appears when saving a post. Link to validation status post from admin notice. Re-visit cron integration implementation and REST endpoint. Move additional logic from theme support to validation utils. Account for trashed posts when locating existing post? Restore from trash. Eliminate cap check in favor of auth key or nonce? What happens if an individual URL had it's issue fixed, but it isn't fixed on the other URLs with the same problem? Export queried object as response header to store in validation status, then add link from queried post to the validation status post? Add ability to ignore certain validation errors? Dismiss a validation status by changing it to something else. Let pending mean it is not dismissed, but rather unprocessed. See #1003. Leverage xml sitemap to crawl site for WP cron and WP-CLI. * Eliminate saving of validation status post when doing GET request; only store validation errors by invoker. What a massive effort. And what a great result! This sets us up in a big way to do way more with validation in upcoming releases.